All our items are handmade in Britain by a family-run business with over 35 years experience making high-quality furniture. Using traditional British furniture-making techniques, a great deal of skill and love goes into each item to ensure you get a beautiful piece of furniture that you’re proud to have in your home. We’re super confident about the quality of our furniture, that’s why we offer a 25 year wood frame guarantee on all our items and a 10 year guarantee on all our sofa bed and bed mattresses. In addition we offer Staingard Protection. This covers your item for 5 years against accidental spills, stains, marks and damage such as wine spillages, tea disasters, tears, pet scratches and much more. Read more about Staingard Protection here. Can I be certain that the fabric on my item will be an exact colour match to my sample? In short, not always. Fabrics can be an inexact business. Batches can differ in shade and tone ever so slightly which means that if the sample comes from a different batch to what is used to make your item there might be a very slight variation. However, to be honest, the variations are negligible. What we do promise is if you order more than one item with us at the same time they will be made from the same batch and thus will be a perfect match. What cushion fillings do you use? We fill our cushions to make them so comfy you could sit on them for days on end without getting a sore behind. All our back cushions are filled with fibre and our seat cushions come with three options. The first is reflex foam wrapped in stockinette. They provide a very supportive and relatively firm sit and they also keep their shape extremely well and require very little maintenance (a plump and turn every 2-3 months). The second option available is siliconized hollow fibre within individual sewn channels within the cushion. The channels are like in a duvet, they stop the fibre all going into one place and the fibre is silicone treated to stop it from gathering and to keep it supple. If you like a slightly softer sit and a more relaxed look then this option is for you. However, they will need a little more love. We recommend a quick plump-up after use and a real shake down once a month. The third option available is a high quality reflex foam wrapped in Grade A Duck Feathers sewn into individual channels within the cushion to stop the feathers all going into one place. These are really snug on your bum but like our siliconized hollow fibre cushions require a quick plump after use to keep their shape and comfort. Can you do bespoke sizes? Whilst we will of course try our best to accommodate such requests please understand that very often we have to say no. 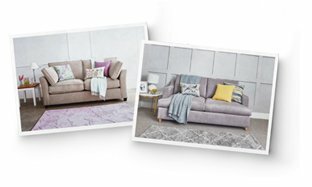 Extending a dimension which sounds quite simple, such as the depth of a sofa, actually involves some rather hefty changes in frames, cutting patterns and cushions – it can become excessively expensive. Any bespoke changes will add to the cost and delivery time – please call us to chat it over. What mattress comes with your sofa beds? Our sofa beds come with a beautiful, handmade 14cm deep sprung mattress as standard and most also provide the option to have a pocket sprung or memory foam mattress instead if preferred. What mechanism do your sofa beds use? We use a fantastic pull-out mechanism – light and easy to use, yet ridiculously hardy with a solid wood-slatted base and high-quality webbing, to offer the best support possible. We don’t believe you should have to compromise on a good nights sleep because you’re on a sofa bed. That’s why you won’t find us using any of those flimsy trampoline type mechanisms you often see. Will your bed mattresses fit on any bed or divan? Yes, as long as the bed or divan follows the standard UK sizes of single, double, king size and super king then our mattresses will fit perfectly with any of them. How are you able to offer better value than the high street and other online retailers offering a similar high quality? Here at Willow & Hall we’re passionate about our items and service, not about expensive shops and gimmicky marketing campaigns. This means we’re able to offer you beautiful, high-quality furniture at affordable prices. Do I need to try before buying? In a nutshell, no, we don’t believe you do. We’ve tried and tested 1,000s of products and hand-picked all our materials, from fabrics to cushion fillings, so you know with us, with any choice you make, that fabulous quality comes as standard. No, we don’t, but we do offer product info cards for each of our lovely styles that you can download or order to receive in the post with your chosen fabric samples as part of our cosy pack here. We do recommend that the best way to get a complete understanding of us and our items is to have a look around our website. Can I get free fabric samples? Please do – we recommend you do this so you can look and touch the fabric before you order. We offer up to eight fabric samples for free. Just click here to order and we’ll put them in your cosy pack and pop it in the post for you right away. You can order online, by phone or in our showroom. We accept all major credit, debit and American Express cards. You can also pay using our 0% finance. Read more here. Can I purchase with finance? Yes no problem. We offer 6 or 12 months 0% Interest Free Credit on all purchases of £1,000 and above. Read more here. Yes, very safe. Our payment gateway is provided by Sage Pay and is extremely secure. In addition we use high-level SSL encryption technology – the most advanced security software currently available for online transactions ensuring the details you provide us are protected to the highest of standards. Once the order has been processed an order confirmation email will be sent to you. If you placed your order online you will also receive a call to confirm we have received your order and to run through any customisation choices. We normally estimate delivery from 3 working days for all stock items to 4-5 weeks for all made-to-order items. Can you take away and recycle any of my old furniture? Yes we can take away your old items for recycling from £45 per piece. Just select this option when you checkout or let us know over the phone or in the showroom when you order. I’m afraid at the moment we only provide our items to the UK Mainland however we are more than happy to deliver to a port or shipping company of your choice. Give us a bell and we'll talk you through how this works. We deliver from 7am-6pm Monday to Saturday and are happy to work with you to accommodate deliveries before leaving for work and/or around school runs and so forth where we can. How can I amend my delivery details? If you wish to amend your delivery details then that shouldn’t be a problem so long as the order has not already been delivered. Please call us on 020 8939 3800. We can cancel your order if it has not yet been delivered so please call us. However, if your order has already been delivered, then you’ll need to follow our returns policy in the event of an unwanted item. What happens if I don’t like my item when it arrives? Just let us know within 30 days of receiving your item and we’ll collect it and give you all your money back. Please note that bespoke items can be returned however a restocking fee of 55% will be deducted from your refund as well as any delivery costs. Please see our Terms & Conditions for full details. How do I exchange an item I have bought online? You need to reorder the new item and follow our returns procedure outlined above for your unsuitable item. Can I return sale and discounted items? We'll refund your credit or debit card within a maximum of 14 days (but usually 2-3 days) of the item being returned to us. You don't need to contact us to inform us that you have sent an item back for a refund. Once we've received the item, we will automatically action your refund. 020 8939 3800 or drop them an email at [email protected]. We're always on hand and happy to help.